PRICE REDUCED! Take the Matterport tour now from the comfort of your own computer! 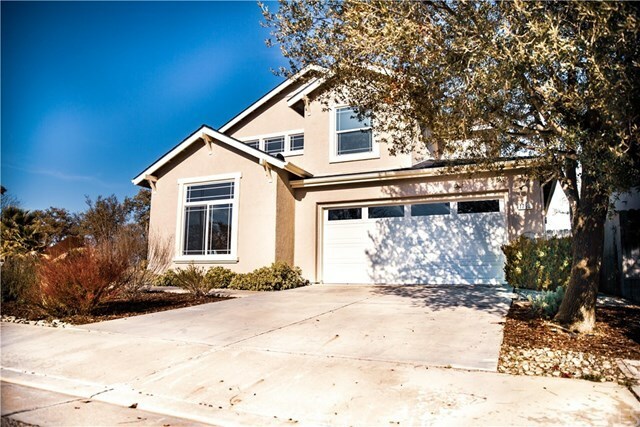 This beautifully updated 4 bedroom, 3 bath home is located in a quiet Paso Robles neighborhood at the end of a cul-de-sac. It is close to town and schools. When you pull up to this gorgeous, 2 story home you will notice the attractive and money saving drought tolerant landscaping. The inside features fresh new paint downstairs, warm toned laminate flooring and the brand new carpet. Curl up with a book in your comfy chair with the fireplace while keeping an eye on what is cooking in your kitchen. Brand new quartz countertops are featured in the kitchen and laundry room. The kitchen has a new range and clean white painted cabinets which show off the new tile backsplash. There is plenty of storage in your walk in pantry! The 4th bedroom is located downstairs, along with an office/den that features it’s own sliding door private entry. It would be great to use as a home office or mother in laws quarters. The large master suite has an amazing walk in closet and an updated bathroom. There are ceiling fans in all of the bedrooms which are beneficial in both the summer and winter to cut heating and cooling costs. The back yard has drought tolerant landscaping, with plenty of room for entertaining on the concrete and interlocking paver patios. There is a large shed in the backyard for additional storage! Even the 2 car garage has built in cabinetry for more storage and organization of your tools, etc.